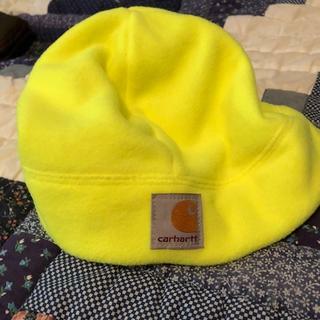 Men's high-visibility beanie designed for the cold. This men's beanie helps you stay seen when working in cold-weather conditions. It's made from color-enhanced fleece that feels soft and warm. Great beanie! The color is great during the night when working outside --a bit of that extra safety (cuz it's always the OTHER person you have to watch out for). Fits great, can fold up the lower edge if you want the top closer to your head, or leave it as is to let some head heat ventilate. Only thing I would change -- add one of those built in LED flashlight system as it would be VERY useful at night. Great high visibility hat. Keeps me warm while working outside. Beanie... so my head stays warm. This is an awesome beanie. Super soft, great quality. As you can see.. it is not really green at all, but thats ok.
We ordered these hats for our employees, they love them. They stretch are warm and comfortable. Love the high visibility. It is warm and well made. Warm hat with bright orange colour. The fit looks/feels sloppy on my medium (7-1/4") head and it was made in China. We appreciate your feedback and will be glad to share it with Product Design. Is this beanie certified to be worn underneath a hard hat? BEST ANSWER: This beanie doesn't have any type of ANSI rating. Do this beanie run small? BEST ANSWER: This hat is true to size. I guess average. I bought these for my husband and adult son. Neither said anything about them being tight or restrictive. My son has quite a thick head of hair and not an overly large head and it fits him comfortably. There is quite a bit of stretch to it (but hasn't gotten stretched out after about a year). Hope that helps. No, it does not run small. It fits very comfortable. I have a larger size head and I'm very comfortable with it. I find this beanie looks and feels loose on my 7-1/4" (medium) head. No, it's pretty big actually. And I have a lot of hair. My beanie fit perfect and I have a rather large Head.. This hat is VERY true to size.